DISCO RECHARGE: GRAND TOUR/SOUTHERN EXPOSURE: The Forgotten Elegance Of Canadian Disco – Schlockmania! If disco music was the perfect vehicle for the producer-as-artist, the ultimate medium of this expression for such producer/artists was the album format. This is what separated the maestros from those who were just chasing the pack: the best disco producers could either up with a concept big enough to fuel an entire album or simply sustain an album on a cut-by-cut basis by crafting enough strong material to justify the running time. Producers like Alec Costandinos and Giorgio Moroder are good examples of disco producers who had this skill. A lesser known but equally worthy example is the Canadian team of Willi Morrison and Ian Guenther, better known as Three Hats Productions. This duo is best known amongst discophiles for their THP Orchestra albums (read a review of the first two THP Orchestra albums here) but they released a number of other worthy disco projects that worked well at album length. Disco Recharge has recently packaged together two such albums, On Such A Winter’s Day by Grand Tour and Headin’ South by Southern Exposure. As this review will reveal, the first is conceptual disco at its most elegant while the latter is a song collection sustained by strong, ambitious musicianship. Disco is not just for dancing. Some examples of the form work as excellent mood music. 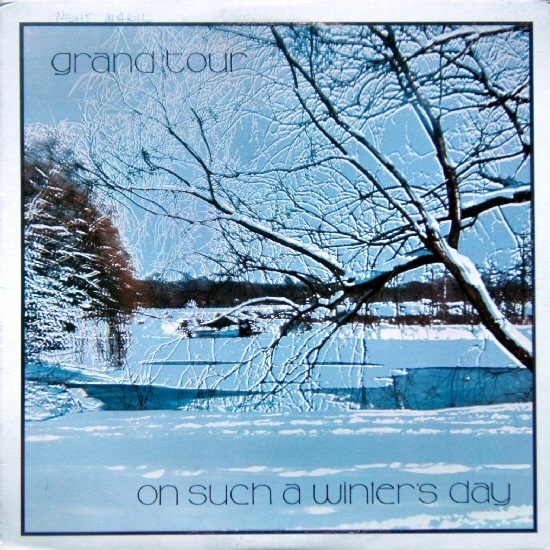 On Such A Winter’s Day is a strong example of this sort of “disco lounge” approach, offering a half-instrumental, half-vocal bill of fare that is united by the concept of travel (Voyage showed a similar fixation on their first two albums). Morrison and Guenther bring this concept to life with a sound that fuses continental elegance with a Los Angeles-influenced slickness to craftsmanship, an aim helped mightily by the use of veteran American arranger Jimmie Haskell to handle the arrangements. The vocal half of the album features an elegant theme song “Grand Tour” that captures the romance and adventure of travel with a jaunty arrangement where a female chorus glides over a gentle but insistent beat layered with subtle orchestral colors. The other songs are covers, a jazzy rendition of the Yardbirds’ “Still I’m Sad” that distills its moody Gregorian chant-meets-Eastern melody flavor and a lovely take on the Mamas and the Papa’s “California Dreamin” that plays its disco elements with great subtlety so as not to detract from the mournful elegance of the melody. The latter could pass for soft rock as easily as it could disco. The instrumental half is just as lovely: “Let’s Go Boating” is a brisk piece that uses Tijuana Brass-style horns to create a lush bit of easy listening while “Flight From Versailles” plays up the disco element with an irresistable high-hat-driven rhythm plus a melodic bass line and subtle synth work to flesh out a playful orchestral melody. That said, the sleeper fave in this area is “Late November,” a moody midtempo item that highlights some jazz-inflected guitar and organ work against a plush cushion of strings. All in all, On Such A Winter’s Day is an ace example of disco lounge fare, offering enough musical color and variety to sustain the travel theme but uniting the sound with a consistently high level of musicianship and elegance. If listening to disco required a fashion choice, you’d want to break out the top hat and tails for this album. In contrast to the mood music aesthetic of On Such A Winter’s Day, Headin’ South is aimed squarely at the dance floor. It found Morrison and Guenther working with arranger Pete Pedersen, who worked with the duo on their classic Two Hot For Love album. Pedersen also cowrote all the songs on this album. What he and THP production team came up with is a varied menu of big-production disco that allows them to flex both the complexity and ambition of their combined musicality. Each of the four songs on this album is a plush epic that covers four distinct styles of disco. The title track is a floor-stormer that kicks things off in grand style, backing up the song’s double entendre-laden lyrics with a dynamic arrangement that shifts the tempo with skill as it weaves in percussive horns, string swoops, not one but two breakdowns and even a fun sing-along chant to close it out. “On Our Way” is classic “sleaze” disco, a sumptuous midtempo item that slowly fades in on a delicately orchestrated instrumental intro before giving way a torch song-ish ballad melody. “Love Is” kicks off the second side and is the lengthiest number, a richly-arranged slice of orchestral disco in the Costandinos/Cerrone vein that allows Pedersen to show off his string arranging skills. “Tight Pants” closes the album with a smile and a wink, offering a fun slab of camp disco with an almost movie musical melody that sports some rollicking piano work and exuberant vocals. In short, Headin’ South is disco at its most purely entertaining, a showcase of musical skill devoted to enchanting the listener with grandiose yet instantly accessible grooves. The Disco Recharge edition of these two albums is a lavish set that devotes one CD to each album and adds a variety of bonus versions to each disc. On Such A Winter’s Day adds single-length mixes for four of the cuts, all of which work well in the confines of a 45-style format. However, the killer inclusion on this disc is a new 19-minute medley of cuts from the album mixed especially for this set by Steve Matthews. This medley is no mere “megamix”: it is designed like the kind of side-length medleys that used to be featured on classic disco albums, with the cuts gracefully woven into something that has a symphonic yet danceable impact. Headin’ South adds a single-length mix for each of the four cuts on the album. The extraction of big sections of instrumental material often gives these versions a slightly different feel but all work well, offering the fan an alternative listening experience that shows off the appeal of these cuts as songs instead of suites. The package is rounded out by well-written liner notes from disco expert Alan Jones that incorporate an interview with Morrison, who looks back on his disco days with contagious fondness. In short, this is another killer from the Disco Recharge organization that highlights two forgotten but deserving albums. If you are a dance music archeologist with a yen for vintage grooves, this set offers a great way to explore the THP sound in all its luxurious variety.